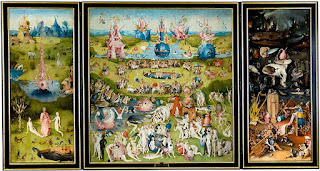 Barnett Newman once said “Aesthetics is for the artist as Ornithology is for the birds.” And Pieter van Huystee’s Hieronymus Bosch: Touched By the Devil currently finishing a run at Film Forum is curiously more about the aerie of art history and museum politics than it is about the work of the great creator of "The Garden of Earthly Delights." Bosch was the proto master of surrealist invention and it’s no coincidence that Spain and the Prado have appropriated the majority of his work and that one of Bosch’s legacies is obviously the output of the two great Spanish surrealists Luis Bunuel and Savador Dali. The Netherlands/Spain connection and the cross-pollination that resulted as a result of Phillip II connoisseurship is one of the more interesting art historical footnotes that the film illustrates. One of the things Hieronymus Bosch does afford is a close up view of the microimagery of "The Garden of Earthy Delights" not usually in the purview of the average viewer; even Dali’s most ambitious inventions are no match for these creations. Another fact the movie reveals is that some Boschs were created after the painter’s death—a seemingly surreal statement that can be explained by the fact that his studio outlived him. What is however even more interesting is the contrast between the world of the paintings and that of those who study them. Hieronymus Bosch falls in the category of The New Rijksmuseum which was produced by van Huystee, and dealt with the Ibsenian politics that surrounded the renovation of one of Amsterdam’s greatest institutions. Yet the world in which the scholarship of Bosch takes place is a little more hermetic and the venues--amongst them Venice’s Accademia--in which the cast of characters operate in order to secure Bosch paintings for a 500th anniversary exhibition at the painter’s birthplace Den Bosch is curiously removed from any of the human iniquity that’s displayed in the artist’s own oeuvre. 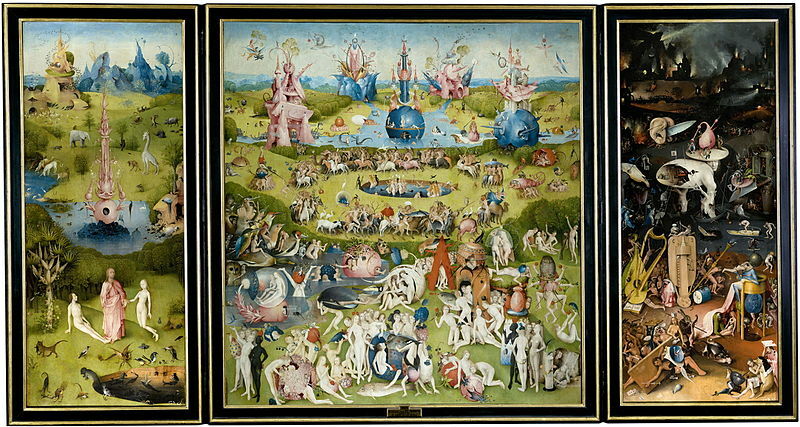 Here is a Europe in which high fallutin art historians negotiate (the Prado’s proprietary treatment of “The Garden of Earthly Delights” is explained by the fact that the work is that museum's “Night Watch”) in an affluent, almost antiseptic world in which there’s rivalry and jealousy but no evidence of "The Seven Deadly Sins and the Four Last Things" (actually painted by a follower of Bosch). For such a breadthy subject the filmmaker has chosen a curiously narrow canvas.